MOVING CONNECTIONS moves households and offices to and from the St George area, Ivins, Santa Clara, Hurricane, Washington City and surrounding area. 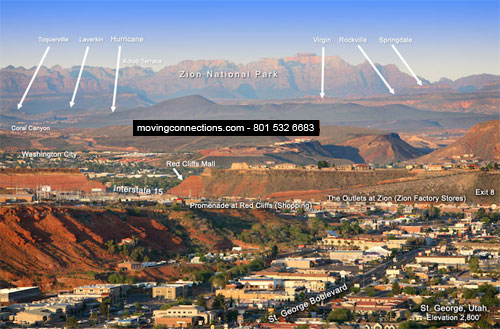 St. George is nestled in the southwest corner of Utah between black lava plateaus and deep gullies. The I-15. bifurcates St. George then swings past Washington before it curves up toward Salt Lake City. The St. George/Washington valley is surrounded by picturesque sandstone cliffs. The backdrop of breathtaking blue skies, clean air, and a friendly business environment attracts over two million international visitors annually. St George not only provides easy access to major markets in the western US, but St George has become a destination point for countless families and businesses looking for a better life. MOVING CONNECTIONS moves households and offices to and from the Vernal and surrounding area. Vernal is situated in eastern Utah on U.S. Hwy. 40 near the Wyoming and Colorado borders. It is the gateway to both Dinosaur National Monument, 20 miles east, and and Flaming Gorge National Recreation Area, 35 miles north. The geology of the region makes it of interest to dinosaurs lovers and geologists. 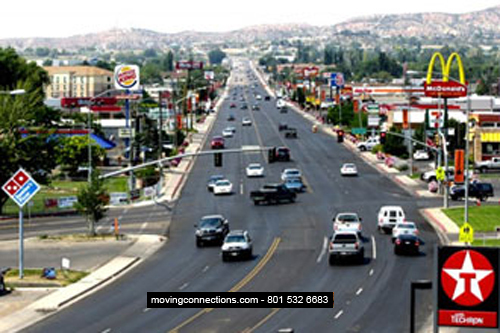 MOVING CONNECTIONS moves households and offices to and from the Logan and surrounding area. Nestled at the foot of the nearly 10,000-foot high Bear River Range, Logan's setting is beautiful in any season. Residents consider Logan Canyon a 40-mile community park leading to 18-mile long Bear Lake, called the Rocky Mountain Caribbean for its azure blue waters. Outstanding fishing, biking, hiking, skiing, and golfing: all are minutes away from your front door. Even with the natural beauty, Logan has an excellent park system, boasting one of Utah's two zoos and a challenging municipal golf course. 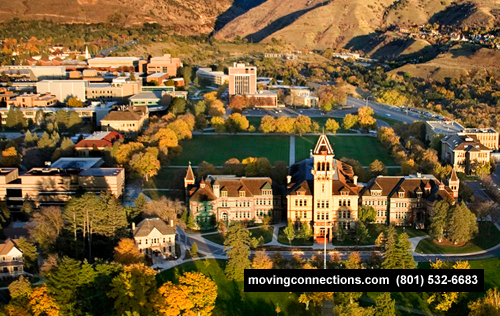 For year round beauty and things to do, Cache Valley is hard to beat. Logan's physical aspects and its quality of life are phenomenal, but what truly defines Logan is its people. Ultimately, it is people who make a community. Hardy pioneer stock, immigrants from the four corners of the globe, students who loved the city so much they couldn't leave, and many others have blended to make wonderful neighborhoods and a great small city.